On Monday, the City of London Local Implementation Plan will be published and made available for public comment. UPDATE: Our campaign to get people to object to the City of London transport plan is in full swing. If you want to object to the plan, you can use our template letter here but far better if you have 30 minutes to spend some time preparing your own response to the City's transport plan and sending it to the same people listed on the template. You can borrow any of the points raised below or in these backgrounder articles we've written here and here. For those of you who think this sounds like something rather boring and bureaucratic, I can assure you that it absolutely is. The 'cycling revolution' and 'smoothing traffic flow' interest me. 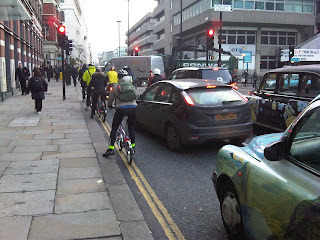 I talked about traffic flow back in September in this article here. A junction like Vauxhall gyratory is here to stay because it 'smooths traffic flow'. If you've ever cycled or walked round here, you'll know that means motor vehicles driving at aggressive high speeds (usually 40mph+) across five-lanes while pedestrians and people on bikes scuttle around the traffic rather apologetically using cattle-pen style crossings that prioritise motor vehicles (you usually have to wait at two or three sets of crossings just to cross one street) and they are hardly cycle-friendly environments. In other words, 'smoothing traffic flow' feels to me to be entirely contradictory to the 'cycling revolution'. Paris, by contrast, is 'prioritising' bicycles and deliberately not making it easy to drive around in a private motor car. Back to the City of London, though, and to the Local Implementation Plan. Each borough submits its own version of this Plan and this details how the borough intends to implement its part of the Mayor's Transport Strategy. And the City's Plan is encouraging in many ways. I profiled it in some detail a few weeks ago in this article here. 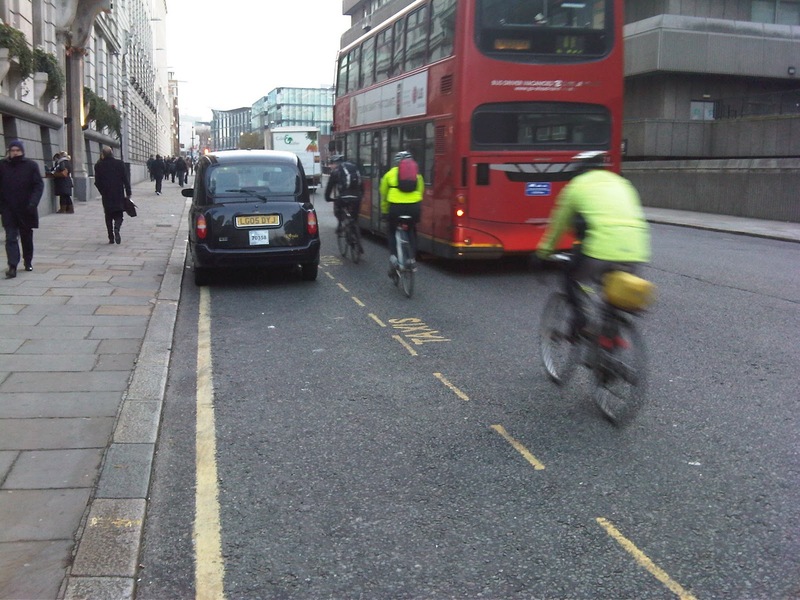 The City of London believes that by 2020, 10% of all journeys in, out and within the City will be on a bicycle. That’s up from 2.6% at the moment which is very good news. The actual result was 2.6% of all journeys. And the City did virtually nothing to reach that 12% target, it seems to me, other than wonder why the number of cyclists being killed on its streets was rising. To be fair, we have some more contraflow streets where bicycles can now travel in two directions. And that's a huge step in the right direction. But it's not enough. In Paris, almost every single one way street is now two-way for bicycles. In Berlin there are 250km of these streets (not to mention 400km of segregated bike lane). In the City, we have a few streets. And the reason is that the cycling revolution gets a whopping 0.45% of the City's planned budget. My personal opinion, shared by many others who I've been working with is that the City simply doesn't have a strategy for improving conditions for people on bicycles. It realises it needs to make an effort. And there are some laudable examples of recent good planning (think of the new obligatory bike lane along the City's bit of High Holborn as a good one). But what we're going to get is isolated bits of bike lane. We're also going to get a lot narrower streets where it won't be possible for a bus to overtake you on your bike. In effect, fellow bicyclist, you will become a living speed hump on the new layout along Cheapside. Same will be true in St. Paul's Churchyard. And the same in the streets around the Barbican. Some of us think it's time to say enough is enough. And we want to engage with the City in a positive manner to think about doing something that will actually generate that 10% share of all journeys being made by bicycle. And I have to thank a large number of people for getting involved and supporting this initiative. On Monday, this blog will feature an email you can cut and paste and send to the City to oppose the Local Implementation Plan in its current form. We have drafted three things: a) an email you can send to your friends to encourage them to get involved; b) a document with all the background you might want to read if you're really interested in this stuff and c) a template email to send to the City of London and a list of people to send it to. In all honesty, we're hoping that people will write their own emails but we're giving you the template in case you don't have the time to get your head around all of this. And it's just that. It's a template you can mould and shape and make your own. And then send it City-wards. And the more of us who get involved, the more I hope we can make the City of London sit up and listen. And start taking bicycling more seriously. I don't believe the bicycle is the answer to all of life's problems. But I do believe it's a rational way for people to travel in a major city centre. And I want my little niece to be able to visit St Paul's with me on a bicycle on a sunny Thursday afternoon when I have a day off. There's no way her parents would consider that at the moment, even though they'd happily let her do that in Paris now. If that strikes a chord with you and you don't think I'm an idealistic dreamer, then please check in next week and see how you can get involved. Can't wait to write my input! I'm impressed and I'm gettng involved as of now. "If it is to be, it is to be by me" applies. Well done and good luck. WallToAll. Brilliant. Thanks for doing that. I appreciate you'd like us all to be self-reliant and write our own e-mails but a template always works for me, even if I tweak it. Looking fwd to it! Thanks again. Excellent post. I heard about this on London Cyclist. Are LCC pushing it? Do you have names at the other boroughs we can email? Excellent stuff, am keeping tuned in and encouraging my readers to do the same! LCC are pushing this for many of the other boroughs but not, as far as I'm aware, for the City. Even if they were, the City wouldn't really take much notice. It has made it explicit that it will only listen if a large number of individuals get involved, rather than a campaign organisation like the LCC. Which is why I'm so keen to get people who have any sort of connection with the City (work here, live here, cycle through here) to get involved.